The Dodgers captured their third N.L. Pennant in four seasons as they won the 1966 flag. They were the first team since the 1957-58 Milwaukee Braves to win back-to-back N.L. Pennants. Since moving to Los Angeles, the Dodgers won their fourth N.L. Pennant in nine seasons. As it always seems to in Dodger history, the chase for the championship went right down to the final game on October 2. With only two days’ rest under his belt, Sandy Koufax tossed a seven-hitter to beat Philadelphia, 6-3 in the second game of a doubleheader to capture the crown over second-place San Francisco, which won eight of its final nine games to put the squeeze on the Dodgers and make it close. Koufax and Don Drysdale waged a holdout in tandem during salary negotiations prior to the 1966 season. This situation was not easily resolved as the dynamic duo hired representation to negotiate. Walter O’Malley and Buzzie Bavasi were involved in finalizing the details of the contracts, as the pitchers originally wanted a three-year, $1 million deal. When the average player salary was $30,000, they wound up accepting $125,000 for Koufax and $110,000 for Drysdale. O’Malley was extremely careful not to say negative words about the pitchers who had been integral contributors to the Dodgers’ success figuring you can’t publicly bash the product — which, in baseball, are the players. 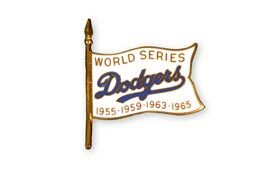 Returning just in time for the start of the season on March 30, the Dodgers got off to a slow start in 1966 (15-14), falling behind the Giants by seven games. But, it didn’t take long before they made their move on May 14, going 16-5 in their next 21 games. In the last month of the season, the Dodgers won 21 of their final 31 games. Immersed in a race with the Giants, Pittsburgh and St. Louis, the Dodgers had two late winning streaks of five and eight games, took over first place on Sept. 11 and held on to claim their second straight N.L. Pennant. The pitching was phenomenal, as the club’s 2.62 ERA was the lowest in the N.L. in 23 years. Opponents scored two runs or fewer in 80 games and were shutout 20 times. Koufax, in his last season, delivered huge results, going 27-9 with a miniscule career-best 1.73 ERA and 317 strikeouts in 323 innings pitched and winning his third Cy Young Award. Despite pitching through incredible pain due to an arthritic left elbow, Koufax became the first major league pitcher to record 300-plus strikeouts in three different seasons. Drysdale finished 13-16 (at one point losing six straight decisions in June), while Claude Osteen had a 17-14 record and Don Sutton was 12-12 in his rookie season. Relief pitching fell into the capable hands of Ron Perranoski, who won six games and had five saves and Phil “The Vulture” Regan, who went 14-1 and saved 17 with a 1.62 ERA. Perranoski tied a record for relief pitchers when he struck out six consecutive New York batters on Sept. 12. Tommy Davis, the last Dodger to win back-to-back N.L. batting championships, returned from his 1965 ankle fracture to hit .313. He was joined by Willie Davis (.284), Lou Johnson (.272) and John Roseboro (.276). Jim Lefebvre topped the home run charts with 24, while batting in 74 runs. A thorn in the Dodgers’ side in 1966 was Larry Jaster of the St. Louis Cardinals, who recorded five shutouts all season, all against them. In September, Dodger pitchers had four consecutive shutouts in a four-game sweep of the Houston Astros. 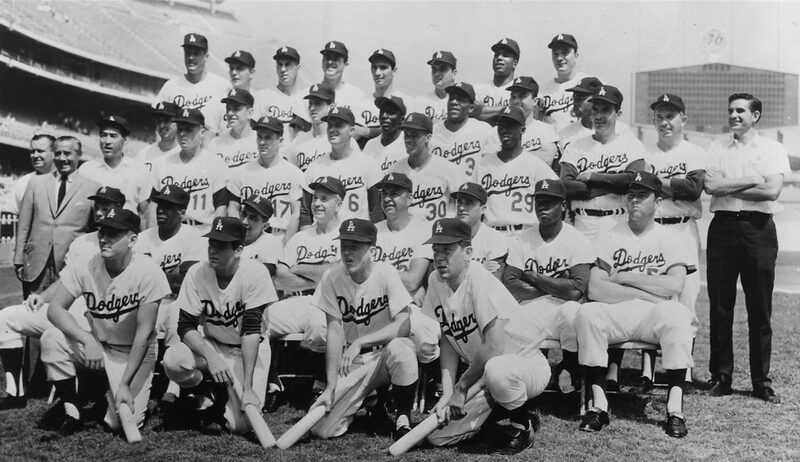 In June of 1966, the Dodgers selected Bill Russell and Charlie Hough in the Free Agent Draft. The Dodgers were swept in the World Series four straight games by the pitching-rich Baltimore Orioles, who shut them out in the final three contests. The season ended as it had begun, with Koufax grabbing the headlines. Only this time, it would be a sad day for the Dodger organization, as the one of the greatest pitchers in baseball history decided to retire. Koufax, who continued to suffer from an arthritic left elbow, made the stunning announcement on Friday, November 18. In the offseason of 1966, the Dodgers made a return trip to Japan, 10 years after the Brooklyn team made a similar excursion. 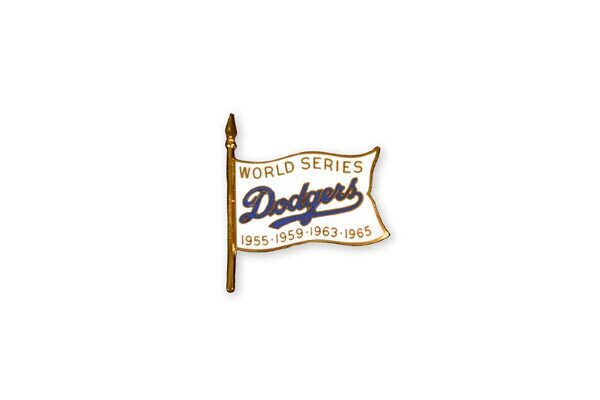 The Dodgers were 9-8-1 on the 18-game goodwill tour. 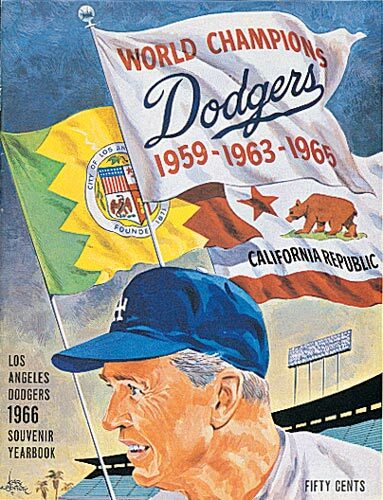 Click image for a larger view1966 Dodger YearbookCopyright © Los Angeles Dodgers, Inc.
Click image for a larger view1966 DodgersCopyright © Los Angeles Dodgers, Inc.
Al Campanis, Director; Dwight (Red) Adams, Cliff Alexander, Hugh Alexander, Romanus (Monty) Basgall, William Brenzel, John S. Carey, Leon Hamilton, Goldie Holt, John R. Keenan, Tom Lasorda, Ed Liberatore, Harry (Ted) McGrew, Greg Mulleavy, Kenneth Myers, Rudy Rufer, Edwin (Duke) Snider, Ben Wade, Guy Wellman, Bert Wells.